However, many experts agree that today Chinese car companies face a lot of challenges that may well change the landscape, making some manufacturers consolidate. As of 2014, the total annual output almost reached 24 million vehicles. Many of these cars were sold domestically (there are more than a hundred vehicles for every 1000 people in China). Four largest manufacturers are SAIC, Chang’an, FAW, Dongfeng. The list of ten top car makers also includes First Automobile Works, Beijing Auto Group, Guangzhou Automobile, Chery, BYD, Brilliance, Jianghuai Automobile. Owned by state, SAIC Motor Corporation Limited is the largest of Chinese car companies. It operates all around the world and is world’s 60th largest company. As of 2014 SAIC produced more cars than any other auto manufacturer in this country. Its production volume reached 4.5 million vehicles. More than a million of SAIC vehicles are commercial vans. Motor Corporation traces its origins to 1940s. It has successful joint ventures with such foreign manufacturers as Volkswagen and General Motors. Among brands owned by this company are MG and Roewe. Hongqi has been producing luxury cars ever since its inception (1958). The first generation of Hongqi cars was used to transport party elite. Chairman Mao had personal interest in development of this company. The Brand’s name means “red flag” (it symbolizes Communist party). There were no Chinese car brands before Hongqi. Its very first car was CA72 based on a 1955 Chrysler. Eight years later CA770 appeared. This model was manufactured until 1980, and more than 1,600 units were made. Cars of the next generation, CA7200/CA7220 and CA7460, were based on Audi 100 and Lincoln Town Car respectively. By 2006, HQ3 was launched, which was very much like the Toyota Crown Majesta and did not enjoy market success. However, these vehicles are often purchased by government officials. Property of BYD Company, this brand exists since 2003. Within the first decade of existence it sold over 500 thousand cars locally, which makes it China’s top-selling brand and the world’s tenth top-selling brand. The product range is very diverse; it includes passenger cars, buses, compacts, sedans. A 50:50 joint venture with Daimler produces expensive electric cars sold under Denza marque. Chery was founded by the government and still remains its property. This company manufactures both passenger and commercial vehicles, distributed by the Chery and Karry brands respectively. QQ city car is Chery’s top-seller. Chery can be definitely included in the list of most influential Chinese car companies. Although situation on the market varies from year to year, it remains one of the leaders. In 2012, for instance, it produced over 585 thousand cars, becoming China’s 10th largest auto maker. Chery is based in Anhui Province. Although the formal name of this company is Zhejiang Geely Holding Group Co, it is widely recognized just as Geely. This word has a positive meaning in Chinese language (it can be translated into English as “auspicious” or “lucky”). It is based in Hangzhou. Founded in 1986, Geely initially was just a small refrigerator manufacturer. However, its founder, Li Shufu, managed to quickly adjust his business to the market and turned it towards the auto industry. Unlike most other Chinese car brands, Geely is not connected to the government. A relatively new company producing motorcycles and cars. Headquarters are situated in the southwest of the country, in Chongqing. During more than ten years since its inception in 1992 Lifan hadn’t produced a single car: it started to make automobiles only in 2005. Actually, this large company was started just as a motorcycle repair shop with less than 10 employees. Today, Lifan’s product range consists of passenger autos, as well as microvans, motorcycles, trucks, and mini-vehicles. A lot of cars (especially small passenger ones) are marketed in developing countries. In 2004 this company was involved in a trademark dispute with Honda Motor for making motorcycles under “Hongda” brand. Honda Motor successfully sued Lifan, so it ceased using this brand name. According to the company’s official website, Great Wall Motor Company Limited is China’s largest SUV and pickup maker. Today it produces vehicles under two brands: Haval and Great Wall. In addition to SUVs and pickups, it also makes passenger cars. Great Wall Motors operates through more than 30 subsidiaries and has four auto plants. The history of this company started in 1984. Initially, its product range was rather poor and included nothing but trucks. However, Great Wall Motors grew into a prosperous auto company, listed in many rankings (from “China’s 500 Most Valuable Brands” to “Forbes Asia Fabulous 50”). It is the first privately-owned car maker in China to be listed on the stock exchange. Jiangling Motors Corporation (shortened to JMC or Jiangling) was established in 1952 (Nanchang) as a truck repair shop. A new turn came in 1993 when it joined forces with Isuzu and Itochu to manufacture truck components. Shortly after, its shares got listed on Shenzhen Stock Exchange. In 2005, Landwind brand, owned by Jiangling, became the first of Chinese car brands to be sold in Europe. It launched a SUV named X-Pedition. Five years later JMC began to sell Yusheng SUV – the very first car under its own brand. This auto manufacturing company is based in Shenyang and produces cars, microvans, and auto components. Most cars designed and manufactured by this company are sold under Brilliance brand. Brilliance Auto Group developed from an auto factory owned by Chinese Government to top-sold minibuses producer. This change occurred between 1991 and 2002. In 2012 production volumes exceeded 650,000 vehicles. The company Changan Automobile was founded in 1862. It includes six manufacturing sites in the territory of China, as well as 15 plants producing cars and engines. 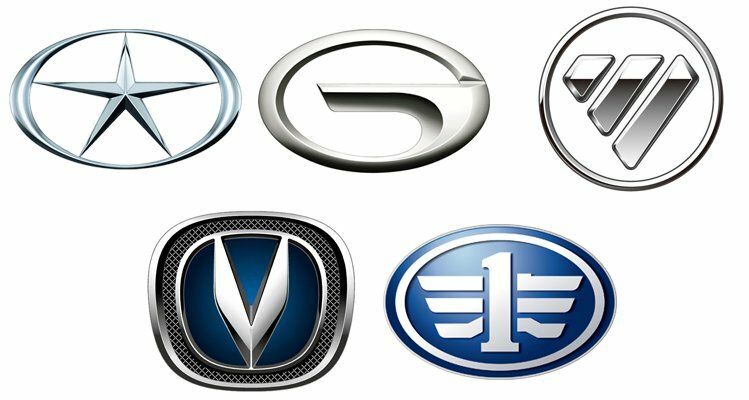 The Changan emblem has two fonds – the main and an additional one. The inner circle, which is a symbol of Earth, is applied on the additional fond. The symbol of the planet is enclosed into a circle of larger size. The blue color shows the expression of conceptual development of the company, which is based on the use of up-to-date technologies and an eco-friendly approach to the workflow. The V-similar symbol in the center of the logo symbolizes the victory and eternal values of the company. FAW is an abbreviation of the name First Automobile Work. The company was founded in 1953. Today, FAW has more than 20 enterprises, which produce car facilities and components in the native region of the company (the province Jilin). The company involves more than 50% of the economy. Its primary activity includes different capacity trucks (small, medium, large ones), off-road vehicles, buses, cars, and compact cars. According to the original idea of the make owners, the logo must embody the corporation as an eagle spreading wings and conquering the space. Therefore, we see the figure “one” with wings drawn in simplified form and the brand name on the emblem. The company Foton was founded in China in 1966. The company is considered a state one; it is on the list of Shanghai stock exchange. Foton produces mainly commercial cars. The emblem of Foton is represented as a triangle separated by two slanted stripes into three parts. GAC Group is a Chinese car manufacturer and a subsidiary of Guangzhou Automobile Industry Group. GAC Group sells cars under the make Trumpchi, motor and business transport vehicles under the brand Gonow, SUV under the brandname Changfeng Motor, buses under the make GAC Bus. As the company is concentrated on consumers’ transport vehicles, it produces large passenger buses and commercial trucks, although it is outside the top ten of commercial car manufacturers in China. The joint stock company Jianghuai Automobile Co, Ltd was formed in 1964. Dzhak cars became the first sent for export. Both low tonnage JAC trucks and spares for them are manufactured at the plants of the company. The company Jianghuai Automobile Co, Ltd has its technology research center with four institutes. As the Chinese manufacturer pays great attention to the foreign markets, the Project center, the task of which includes the coordination of all European branches of the company, was founded in the Italian city, Turin. JAC cars also have great popularity among government organizations inside the country.